When news of the fire at Paris’ Notre Dame Cathedral broke yesterday, people around the world reacted as the medieval church—one of the most visited and revered in the world—seemed to crumble live on television. The Alcalde spoke with UT Art History Professor and medievalist Joan A. Holladay about the significance of the building, the fire, and what the future might hold for the centuries-old cathedral. How did you feel when you heard the news that Notre Dame was burning? I was devastated. It was heart-wrenching. A colleague texted me. I thought oh no. It was bad. It seems that some parts are salvageable, though. The news as of this morning is not as devastating. The building is a historical mashup. It goes to about 1270, then various things were added on. The roof is a kind of superstructure—it was not an integral part of the stone building. The spire was 19th century. In the course of being built, it was changed so it doesn’t reflect its 1160s intentions as it stood yesterday morning. Then it was renovated in the 19th century by a very important restorer. The question now will be to what state do you restore it? The way the photos looked this morning, the walls are pretty much intact. The shape of the building is still very much there. And if the shape wasn’t there, it would be completely ruined? If the stones had all collapsed and we were dealing with steaming piles of rubble, there would be serious conversations about rebuilding it at all. It was hard to follow what exactly was happening yesterday in real-time. It’s confusing to people who don’t know the complicated history of the building. What I thought was confusing was, they were reporting that, “Luckily, 16 copper statues were removed from the roof.” Removed from the roof? That’s not medieval. When I saw the picture, I said, that’s not medieval. I think of Notre Dame as medieval. Some people on the news view Notre Dame as a shell for historical events that happened inside it, or religious events that happened inside. These are all valid viewpoints but some are of less interest to medievalists like me. Can you give me a sense of how important Notre Dame is to medievalists? Very important. It’s very important partly because it was changed so much while building. A didactic tool is a cheap way to say it. For things that happened in gothic architecture, it’s one of first places where there is evidence of flying buttresses. These are the most typical medieval structural supports. It has historical importance. Also, it’s in middle of Paris. To get to the other great cathedrals, you have to rent a car or take a train, make a real effort to get there. Notre Dame is easy for tourists and lovers of medieval architecture to pop in—though there’s always long lines now. It’s also a way-finding marker on the Paris skyline. It has been since it was built—even more so in the middle ages, when there weren’t six- and eight-story department stores around it. They aren’t that close. I’ve seen people posting pictures of their trips to Notre Dame just last week or a few months ago. We take for granted these historical things we think will outlast us. I work more on manuscripts and sculpture. Manuscripts get burnt and waterlogged. Something like Notre Dame is big, it’s permanent—it’s not going anywhere. Look at the French Revolution, for example. To have something like that go up in smoke is shocking and unexpected. Do you feel hopeful that the cathedral can be repaired? Yes. One of things I said to my class an hour ago is, given pictures from this morning, I feel quite confident in my lifetime we will see a Notre Dame that looks good enough for most of us. It will be looking like a medieval building again. What were your classes like today after the news? It was a no-brainer we would talk about this. [My students] had some really good questions: Could it be restored? Who pays for it? 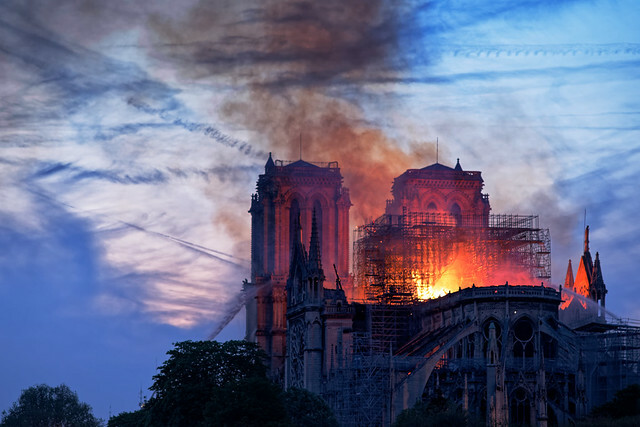 It’s ironic that Notre Dame was damaged during a restoration. This is not the first time that trying to do something good leads to something bad. Renovations involve flammable chemicals and blow torches. The truth is, most of these medieval buildings have workmen on them. I was telling my second class [today] that in 1980, I was in cologne for the 100th year of finishing the cathedral that was started in 1284. People wondered if the cathedral, in any moment, would be without scaffolding. It trickled on into the 16th century and they started it again in 1840 and finished in 1880. Since 1248, there had always been people paid to work on the cathedral. Overall, today’s news is better than yesterday’s. I’m very hopeful. There were some holes in the vaults. The fire caught fire above, where wood supports the lead roof. The vaults did their job. They mostly withstood the high heat and whatever was hitting them from above. If the permanent vertical walls are intact—and looks like they are—I’m very hopeful.